Do you know what my favorite piece of advice from Joe Pass is? Next time you are in a mood for a vision quest, I want you to think of this saying next time you take a solo trip up some deserted mountain somewhere. You need to sit and meditate on this one for a while. Let’s think about this for a minute. What does Joe mean here, by ‘learning as many melodies as you can’? You can take this pithy instruction a couple of ways. Firstly, you could interpret it as learning as many melodies to jazz standards as you can. Too often, students get bogged down by playing the same five jazz standards, trying to get them perfect before moving on. The result? They never develop their repertoire. And in failing to do this, they don’t give their ears the opportunity to develop either. It’s counterproductive working like this. The thing is, by filling your mind with as many melodies as possible, it’s actually a faster way to get a grip on how to play in the jazz style. You have to start somewhere, and jazz melodies are crucially important to get your ears attuned to the sound of jazz. But I think that this saying, ‘learn as many melodies as you can’ has a a double meaning too. Joe Pass always emphasized the importance of lines in his playing style. Short, melodic pieces of vocabulary. These lines are the ‘words’ of the jazz language. The more jazz lines you learn, the better you will be able to communicate your ideas as a jazz musician. The bigger vocabulary that you have, the more expressive and spontaneous you can be in your musical conversations. 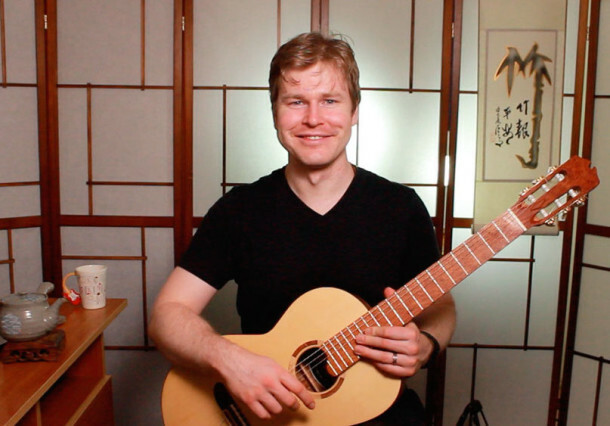 My soon-to-be-released FretDojo Academy Club is going to give you both of these things – a repertoire of jazz standards AND the most important lines to study in jazz – and a whole lot more besides. Every month, You’re going to learn all aspects of playing a well-known jazz standard on guitar (including melody, comping, chord melody, and improv), therefore increasing your jazz repertoire and internalizing those all-important classic jazz melodies. You’ll also learn a bunch of red-hot vocabulary that is broken down for you step by step, and I’ll show you how to apply it to your improvisations in an easy to understand way. In summary, what’s the answer to sounding melodic when you solo? So this time, listen to Uncle Joe, and get yourself on the early bird list for this new program now.